Congratulations to the female JROTC Raider competition team for placing first in the state of Georgia at the State Raider meet. The JROTC Raider competition teams concluded their season on 28 October in Griffin, GA at the State Raider meet. The boys team finished in third place. The physically grueling events included a 3-mile team run, a cross-country rescue event, the tire flip race, one-rope bridge timed event, and a physical fitness challenge. The female team placed first in the team run and cross country rescue and placed second in the tire flip and physical fitness challenge. The female state champion team members include Haley Fusaro, Lily McDonough, Stephanie Reilvitz, Alysa Robinson, Sarah Robertson, Ainslie Smith, Brandi Wright, Nadia McCall, Kalia Whyte, Cera Schulke, Katie Merced. The boys team include Rickeldo Box, Logan MacDonald, Michael Barry, Malcolm Roberts , Tim Sengsy, Greg Sengsy, Dylan Tsui, Aidan MacDonald, Patrick McErlean, Nicholas Jones and Joshua Guiterrez. Well done Raiders and their coach, SFC Charles Blanks! Our fall sports season is coming to a close. All of our fall sports, Volleyball, Softball, Football, Cross Country, and our Competition Cheer advanced to state playoffs. Football plays in the first round of state playoffs tonight, Friday, November 10th, at Lee County. Congratulations to our Boys Cross Country team for finishing THIRD in the State and our Girls Cross Country team for finishing TENTH in the State! Congratulations to all of our hard-working and successful student athletes. We are proud of you all for representing Richmond Hill High School so well! The Armed Services Vocational Aptitude Battery or ASVAB will be given Wednesday, November 15th in the West Cafeteria beginning promptly at 8:00 am. It is open to juniors and seniors who are interested in the military as a career. No fee is required to take this test. Students should plan to arrive at the testing site by 7:45. Students who arrive after 8:15 am will have to take the test on a later date. So plan to arrive early! The test lasts approximately 3 hours, so make sure your students eat breakfast on the day of the test. If you have any questions regarding the ASVAB, please contact Mrs. Lynch at 912-459-6403. Class Dues are $30 each year. Students pay only for the years that they were at RHHS. Dues must be paid online using MyPaymentsPlus. All dues must be paid by Friday, December 1st. Students paying after December 1st will incur a $5 late charge. For Juniors and Seniors, these dues cover the cost of your prom ticket. The deadline to pay dues and have the prom ticket included as part of your dues is FRIDAY, February 23, 2018. If you do not pay dues by February 23, 2018, and you choose to go to prom, you will have to purchase a prom ticket separately at a cost of $125. Thanks for paying class dues before December 1st. Advanced Placement Exam Registration will open November 1, 2017. Students may register for exams and begin making full or partial payments toward the cost of their AP exams beginning November 1, 2017. 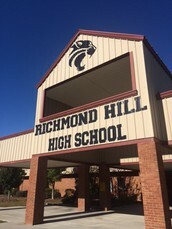 RHHS maintains an Obligations List. The Obligations List notes students who have an obligation - this could be a detention not served, a form not returned, or a fee/fine. As students clear the obligation, their name comes off of the list. Students on the Obligations List are ineligible for school related activities such as Winter Formal and Exam Exemption and early release on exam days. Teachers receive this list daily, and students can ask any teacher if they are on the list and for what reason. Similarly, you could email any of your child's teachers and ask the same. Winter Formal is scheduled for Friday, December 8th, 7:30-10:30pm at the Mackey House. Cost is $27 with Discount Code: Winter Formal (valid until Nov. 18th) then the price will be $32. Want to pay for your date? Fill out this form: http://tinyurl.com/WFDate Then it will appear in My Payments Plus. Winter Formal is open to all grade levels, but students must be cleared from the Obligations List in order to purchase a ticket. The SAT and ACT are given several times throughout each school year. Please click the links below for additional information about test dates, registration deadlines, and information about how to register. Yes, there is something known as "good" stress. Research reveals that stress can actually enhance performance and well-being. Let’s shift our goal from asking students to stress less toward helping them stress better. Here are a few ideas to do just that. Focusing solely on the harm caused by stress indicates to students that stress is bad in an absolute sense, which is simply untrue. Thoughts like "Oh no, I'm stressed, and stress is bad" will only exacerbate the child's worries. The research confirms that stress itself is stressful. Stress can help the immune system. Stress can improve memory and learning. Stress can improve decision making. For example, during test time, a pounding heart can be reframed by saying, "Hey, a little stress is actually helping me on this test -- my body's giving me a little burst of energy and extra focus to get through this." The goal of stressing better is not for students to live in a fantasyland where they never encounter issues that cause real distress. Challenges will arise, and distress may follow. A backup plan can get students through it. So how is this done? Let's borrow a technique from goal-setting researchers. Strategies such as these help us make the best of stress. Helping our high school students learn these strategies could prove very beneficial.